Variation at the PPARG locus may influence susceptibility to type 2 diabetes and related traits. 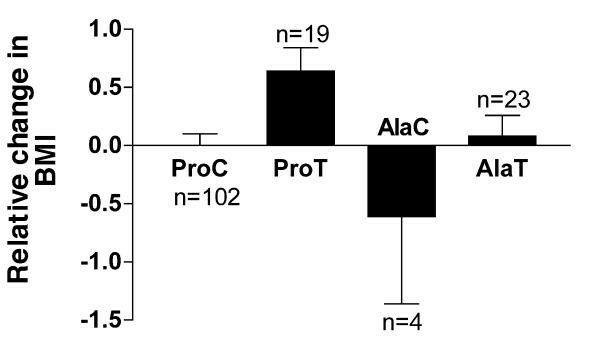 The Pro12Ala polymorphism may modulate receptor activity and is associated with protection from type 2 diabetes. However, there have been inconsistent reports of its association with obesity. The silent C1431T polymorphism has not been as extensively studied, but the rare T allele has also been inconsistently linked to increases in weight. Both rare alleles are in linkage disequilibrium and the independent associations of these two polymorphisms have not been addressed. We have genotyped a large population with type 2 diabetes (n = 1107), two populations of non-diabetics from Glasgow (n = 186) and Dundee (n = 254) and also a healthy group undergoing physical training (n = 148) and investigated the association of genotype with body mass index. This analysis has demonstrated that the Ala12 and T1431 alleles are present together in approximately 70% of the carriers. By considering the other 30% of individuals with haplotypes that only carry one of these polymorphisms, we have demonstrated that the Ala12 allele is consistently associated with a lower BMI, whilst the T1431 allele is consistently associated with higher BMI. This study has therefore revealed an opposing interaction of these polymorphisms, which may help to explain previous inconsistencies in the association of PPARG polymorphisms and body weight. PPARγ plays a fundamental role in adipogenesis and insulin sensitisation  and is a candidate gene for susceptibility to obesity and type II diabetes mellitus. A common structural polymorphism has been detected in the PPARγ gene consisting of a proline (Pro) to alanine (Ala) substitution ). and is located at codon 12 (Pro12Ala) of PPARγ2. The Ala containing variant may have reduced activity compared to the Pro isoform ). This polymorphism has been extensively investigated for association with obesity and type 2 diabetes mellitus [3–25]. The Ala allele is associated with a modest protective effect against type 2 diabetes with an odds ratio of 0.8 . Increased weight and body mass index, which themselves predispose to type 2 diabetes, have however been inconsistently associated with the Pro12Ala polymorphism with some studies indicating that the Ala allele is associated with a higher BMI [5, 18, 24, 25], a lower BMI [3, 8, 26, 27], while other studies have found no association [11, 24, 28, 29, 30]. A second polymorphism has been detected in exon 6 at nucleotide 1431 of PPARG resulting in a silent substitution from C to T (C1431T), this was not originally found to be associated with BMI [31, 32]. Two further studies have, however, shown an association of the T1431 allele with higher BMI [25, 33]. The Pro12Ala and C1431T polymorphisms are in linkage disequilibrium [18, 25]). One study  demonstrated that both rare alleles were associated with an increased body weight in women, and when they occurred together the overall effect was additive. It is not surprising given this allelic association that phenotypes associated with the Pro12Ala polymorphism also associate with the C1431T polymorphism and vice versa, when the polymorphisms are considered in isolation. However it is also possible that these polymorphisms differentially mark separate haplotypes each associated with a distinct phenotypic effect, which has not been explored to date. In order to investigate this we examined association of PPARG haplotypes with BMI in a large sample of subjects with type 2 diabetes in Tayside, Scotland. We demonstrate that increased body mass is associated with the Pro-T haplotype, whereas the Ala-C haplotype is associated with a lower body mass when compared to the common Pro-C haplotype. This finding was then confirmed in three subsequent independent studies. Firstly in two non-diabetic populations from Scotland and secondly in a prospective group of young healthy male army recruits undergoing physical training. Observed Pro12Ala and C1431T genotype frequencies and allele frequencies are given in table 1. Allele frequencies did not differ significantly from Hardy-Weinberg equilibrium. Non-significant increases in BMI were observed with both polymorphisms (table 1). This was only significant when the C1431T genotypes were collapsed (rare allele carriers and homozygotes combined) (p = 0.027). Collapsing the Pro12Ala genotypes in a similar manner did not achieve significance. The two polymorphisms were in tight linkage disequilibrium, as shown in table 2, thus suggesting that phenotypes observed with one polymorphism may be due to linkage with the other. Observed PPARγ Genotype and allele frequencies and their association with BMI in the Tayside type 2 diabetic population. Frequencies of combined PPARγ genotypes and estimated haplotypes. As the regression analysis indicated opposing associations of each polymorphism with BMI and their linkage disequilibrium meant that their interaction could not be analysed in this way, individuals were separated into groups carrying the unequivocal haplotypes, Pro-C, Pro-T, Ala-C and the mixed haplotype group, Ala:T. The Ala-C and the Pro-T haplotypes allowed us to examine the role of Ala12 independently of T1431 and vice versa. There was an association of the Pro-T haplotype with a higher BMI compared to individuals with the Pro-C or Ala-C haplotypes (Figure 1). As predicted by the regression analysis, the effect of the haplotype on BMI was most noticeable and achieved significance, when the heavier individuals were considered (Figure 1B, p = 0.0342, one-way ANOVA). The data for the individuals with the mixed haplotype, Ala:T, were shown in this analysis for comparison. This group consisted of an unknown mixture of haplotypes and the observed mean BMI tended to be intermediate, as would be predicted from the regression analysis and the opposing nature of the polymorphisms when present singly in the Ala-C and Pro-T haplotypes. PPARGPro12Ala and C1431T have an opposing association with BMI in a type 2 diabetic population. A. Shown are the mean BMIs of subjects with type 2 diabetes within derived haplotype, expressed as a difference in mean BMI from the common Pro-C haplotype. The standard error of the mean BMI is indicated B. The individuals with a BMI in the upper quartile of BMI (BMI > 75th centile, 33.65 kg/m2) were analysed as above. As the effect of genotype was dependant on the weight range of the population, we examined the distribution of BMI in the total population in more detail. The Pro-T displayed the highest coefficient of variation (Cv = 24.6%), followed by Ala-T (Cv = 19.86%), and Pro-C (Cv = 18.87%), while the Ala-C displayed the lowest variance (Cv= 16.5%). These difference were highly significant as defined by Bartlett's test for equality of variance, p = 0.0004). As the above analysis was intriguing, yet rather exploratory in nature, we applied an identical statistical analysis to two small non-diabetic cohorts for replication purposes. Whilst the two cohorts from Dundee and Glasgow, both had a similar range of BMI and age, they both had a lower mean BMI than the type 2 diabetic population. In these populations the individual polymorphisms had very little effect on mean BMI (data not shown). However, analysis of BMI in the combined non-diabetic population by multiple regression confirmed an opposing role for the two polymorphisms. Again the 1431T allele was associated with an increased BMI (β = 1.3 kg/m2, p = 0.03) and the Ala12 with a reduced BMI (β = -1.3 kg/m2, p = 0.03). 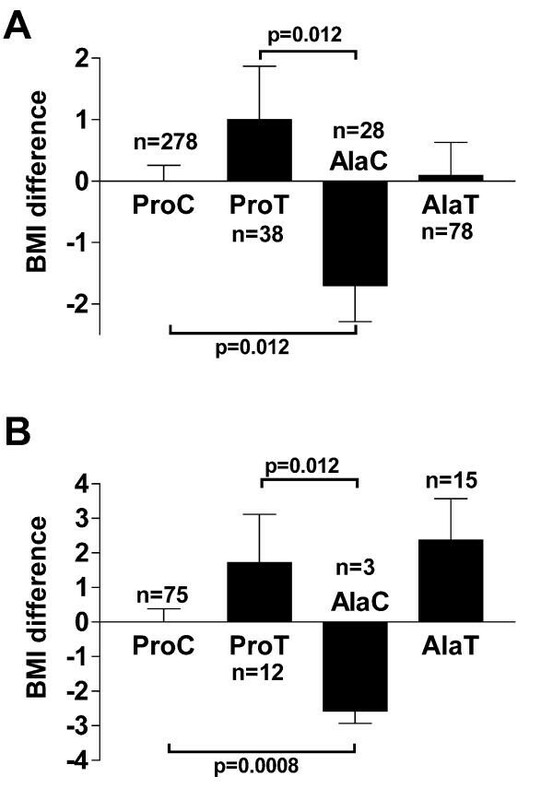 Analysis of the BMI by haplotype in the two non-diabetic cohorts again confirmed the opposing nature of the Pro-T and Ala-C haplotypes (Figure 2A). When we examined the heavier individuals, with a BMI in the upper quartile, the magnitude of the genotypic effect was increased in a similar fashion to that observed in the diabetic population (Figure 2B, p = 0.0431, one-way ANOVA). Moreover, the genotype/BMI variance interaction observed in the type 2 diabetic cohort was replicated very closely, with an identical rank order of haplotypes. (Pro-T = 19.87%, Ala-T = 18.25%, Pro-C = 16.42% and Ala-C = 12.85%). Again these differences in variance were significant (Bartlett's test for equality of variance, p = 0.02). PPARGPro12Ala and C1431T also have an opposing association with BMI in non-diabetic populations. A. Shown are the mean BMIs within derived haplotype expressed as a difference in mean BMI from the common Pro-C haplotype for the combined Glasgow and Dundee non-diabetic populations. The standard error of the mean BMI is indicated. B. The individuals with a BMI in the upper quartile of the combined population (BMI > 27.9 kg/m2) were analysed as above. To further confirm the opposing nature of the PPARG polymorphisms, we analysed the haplotypes in a study of army recruits during 10 weeks intensive training . There were no significant baseline BMI differences between the haplotypes (data not shown). 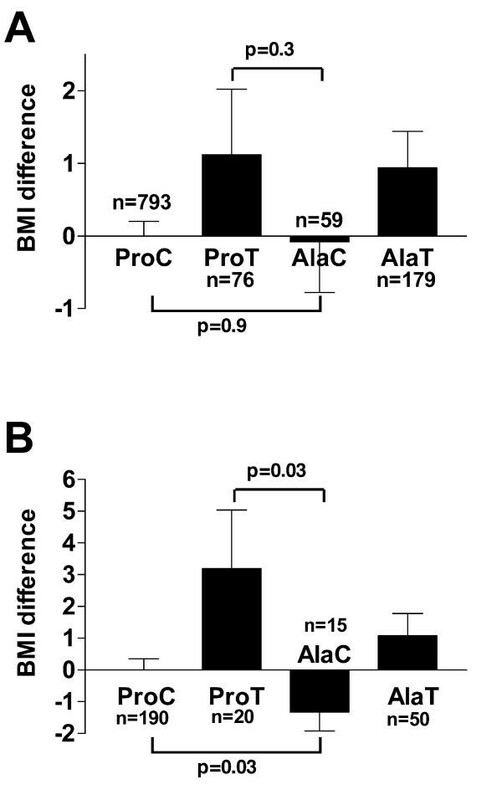 When we examined the change in BMI observed during training, the Pro12Ala polymorphism showed no association with change in BMI (p = 0.57), however the T1431 allele carriers showed a significantly greater increase in BMI than C1431 allele homozygotes (CC = 0.06 kg/m2, CT+TT = 0.41 kg/m2, p = 0.05). When both polymorphisms were considered together we found a significant association between BMI change and the PPARγ haplotypes (Figure 3). Regression analysis revealed a highly significant interaction with the T allele and change in BMI (T1431 allele β = 0.67 kg/m2, p = 0.004, Ala12 allele β = -0.56 kg/m2, P = 0.03). Again this pattern mirrored that observed in the other populations with a greater weight gain in the Pro-T haplotype and a lower BMI change in the individuals with Ala-C haplotype, compared to the common Pro-C haplotype. PPARGhaplotype associations are replicated in army volunteers in response to exercise. Shown is the mean change in BMI observed during basic training by haplotype. We have revealed robust and opposing associations of the linked Pro12Ala and C1431T polymorphisms of the PPARG locus with BMI by considering haplotypes. The haplotypes individually marked by the T1431 and Ala12 alleles were found to be consistently associated with an increased and decreased BMI respectively. This observation has been confirmed in four separate populations. Interestingly, haplotypes were associated with large differences in variance of BMI, and this appears to be a stronger effect than was observed with the mean values. The groups with the Pro-T haplotype had a consistently larger coefficient of variation, suggesting that the weight in Pro-T individuals is less regulated. Conversely, the Ala-C haplotype was associated with the smallest coefficient of variation, suggesting a much tighter control of body weight. This data strongly supports the hypothesis that the action of genetic variation at the PPARG locus is influenced by other genetic or environmental influences. This has been suggested previously in the case of the Pro12Ala variant, where interactions with obesity , diet , birth-weight  and weight regain after dieting  have been observed. Interaction with other genes that modulate body weight may also occur, as demonstrated for the β3-adrenoceptor Trp64Arg polymorphism which strongly interacts with Pro12Ala in determining body weight . Previous studies have observed differences in the effect of the Ala12 allele in lean and obese individuals . This is in agreement with our study where we find little association of PPARG haplotype in the BMI of lean individuals from any of our study groups; however, we consistently see the opposing effects of the polymorphisms in heavier individuals. In addition, the differences in change in BMI observed after intensive physical exercise during training in the young army recruits, further reinforces the concept that variation at the PPARG locus effects the regulation of weight in the response to environmental stimuli. This is the first study to examine such a relationship between PPARG genotypes and exercise in the control of body weight. The association of genotype with BMI was the same in both the populations with and without diabetes, demonstrating that disease status or medication usage does not influence this observation overall. However, this study can not exclude the possibility that there may be interactions between PPARG genotype and these parameters. Furthermore, the diversity of potential treatments in the diabetic population does not allow for such an analysis, which will require a larger population. No significant differences in age and gender by haplotype were observed in our study, however again we cannot exclude a modulatory role of these parameters on the relationship between BMI and PPARG genotype. It is also clear that the extent of allelic disequilibrium may be different in geographically/ethnically distinct populations , and as such, the relationship between the Pro12Ala and C1431T polymorphism may be different in different ethnic groups and thus provide discordant associations when studied in isolation. This emphasises potential pitfalls in interpreting the results of association studies when polymorphisms are considered in isolation. The phenomenon observed in this study may represent a common genetic feature, as opposing phenotypic associations with tightly linked SNPs have also been characterised at the PPARA locus [42, 43]. Finally, it remains unclear whether either the C1431T or the Pro12Ala polymorphisms have a direct functional impact on the activity of PPARγ and thus in the modulation of body weight, or whether there are further, as yet undetected, functional polymorphisms linked with these haplotypes. Two common polymorphisms in the PPARG locus are in close linkage disequilibrium and have opposing association with body weight. These findings may help explain some of the discrepancies in population studies where only one of these polymorphisms has been studied. Whilst the genetics of common variation at the PPARG locus appear to be complex, unravelling this complexity is continuing to reveal that it has a role in the modulation of body weight. In Tayside, Scotland detailed clinical information on all individuals with diabetes mellitus is recorded on an electronic clinical information system known as DARTS (Diabetes Audit and Research in Tayside Scotland) which has been described elsewhere . In brief, electronic record linkage techniques have identified all people with diabetes in the population of Tayside with a sensitivity of 97%. All clinical data are recorded according to a standard dataset and all case records are validated by a team of dedicated research nurses. All such patients are invited to participate in the genotyping initiative. Following written informed consent, a single sample of blood is collected for DNA extraction and genotyping and the individual assigned a unique system code number for anonymisation purposes. Full compliance with NHS data protection and encryption standards is maintained. At the time of this study, of the approximately 10,000 subjects registered on DARTS, around 1300 samples had been prepared. Genotype information is stored together with the anonymised clinical information on an SQL database. The population in this study consisted of a free-living clinical population selected only on the basis of having type 2 diabetes and attending a diabetes clinic in Tayside. All subjects were of Caucasian ethnicity. This consisted of 446 healthy adult Caucasian individuals amalgamated from two separate Scottish cohorts of healthy controls. The first consisted of 90 male and 102 female adults who had been randomly selected from the Glasgow area. The second consisted of 186 female and 68 male adults recruited as matched controls for a breast cancer study. The relevant case/control comparisons will be described elsewhere. The BMI of each individual was recorded once at the time of genotyping. As a separate study the association of genotype with change in weight during exercise training was investigated. This sample has been described previously . Briefly, 148 young healthy white male individuals underwent an identical mixed strength and endurance-training programme for 10 weeks and the change in BMI during the training was determined. Of the 495 non-diabetic individuals 490 were genotyped for the Pro12Ala polymorphism and 476 for the C1431T. The army recruits were analysed by PCR/RFLP analysis as previously described [13, 31]. Unequivocal haplotypes were assigned to all genotypes except for double heterozygotes (i.e. Pro/Ala;C/T) who as a group have an unknown mixture of the four possible haplotypes (Pro-C, Pro-T, Ala-C, and Ala-T). Thus the Pro/Pro;C/C genotype is homozygous for the Pro-C haplotype, the Pro/Pro;C/T and Pro/Pro;T/T genotypes are heterozygous and homozygous respectively for the Pro-T, and Pro/Ala; C/C and Ala/Ala;C/C genotypes heterozygous and homozygous for the Ala-C haplotype. By combining genotypes in this way the phenotypic associations of the Pro-T, and Ala-C haplotypes could be compared to the common Pro-C. Individuals with a doubly homozygous genotype (Ala/Ala;T/T) being homozygous for the Ala-T haplotype were too rare to be analysed. All statistical analyses were carried out using SPSS for Windows version 10 and Instat for the Macintosh version 3 (Graphpad software, San Diego, CA). Graphical representations of the data were prepared using Graphpad Prism for the Macintosh version 3 (Graphpad software, San Diego, CA). ANOVA was used to compare BMI between genotypes. Where biologically appropriate the rare allele homozygotes were combined with the heterozygotes and the difference in BMI with and without the allele compared with Student's t test. Where distributions were not normal the Mann-Whitney U test was employed. Allele frequencies were compared between populations using Chi square. Allelic associations were analysed by comparing the likelihood of the data under the assumptions of no association and of complete association using the EH program . This allowed subsequent determination of estimated haplotype frequencies and estimated linkage disequilibrium coefficient, D through the use of the 2LD program . D was expressed as D', giving the value of D as a percentage of the maximum calculated value given the observed allele frequencies. We would like to thank Shona Hynde of the Ninewells Diabetes centre for recruiting the type 2 diabetics to this study, and also would like to thank Helen Walker and Alasdair Thompson (Breast Cancer controls) for their help and permission to use the information from their control populations. This work was funded by a grant from an anonymous trust administered by Tenovus (Tayside). AD and CP performed the data analysis on the Tayside and Glasgow populations, BF and DF performed the genotyping on the Tayside and Glasgow populations, AC recruited, and phenotyped the Glasgow population, DMF genotyped and analyzed the army recruit study, MW and HEM devised, coordinated and analyzed the army study, DB programmed the electronic linkage tools used for the genetic analysis of the Tayside diabetic population, AM and CP devised and initiated the study. The paper was written by AD and CP with help from all the authors.